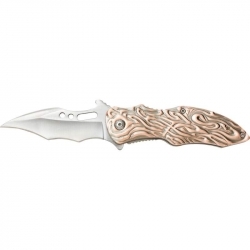 Features brass-tone steel wave design blade and handle. Measures 4-1/2' closed, 7-1/2' open. Limited lifetime warranty. Gift boxed. Measures 4-1/2' closed and 7-3/4' open. Comes with sheath. Limited lifetime warranty. Gift boxed. 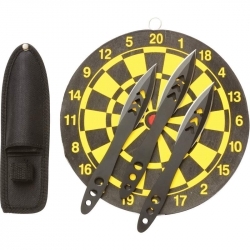 This unique Maxam(R) Decorative Lockback Knife is a prime display item for nature and outdoor enthusiasts. The wolf art on both the knife and the box will captivate and intrigue admirers. 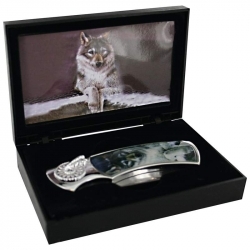 Features stainless steel honed blade, Leymar(TM) handle with wolf inlay and display box with inset wolf image. Knife measures 4-1/8' closed, 7' open. Box measures 5-1/8' x 3-1/4' x 1-1/4'. Limited lifetime warranty. Gift boxed. 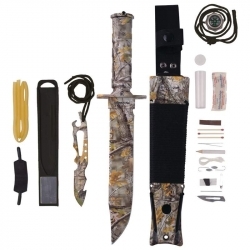 Features anodized aluminum handle, belt clip, glass breaker, and belt cutter. Measures 6-1/4' closed, 10-3/4' open. Limited lifetime warranty. Gift boxed. You can have every type tool in one implement to take on most jobs. 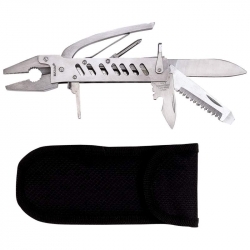 Made from 420 stainless steel it features needlenose and regular pliers, handle and pry bar, wire cutter, 2 wire strippers, Phillips screwdriver, 2 flathead screwdrivers, file, small blade and large drop point blade, serrated blade, bottle opener and heavy-duty Kelvlon(TM) sheath. Measures 5-7/8' closed. Limited lifetime warranty. Gift boxed. Looking for a good knife for personal carry? 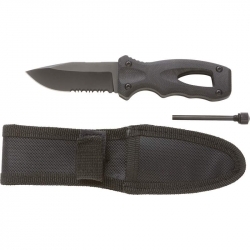 The Mossberg(TM) Assisted Opening Liner Lock Knife is the perfect choice. 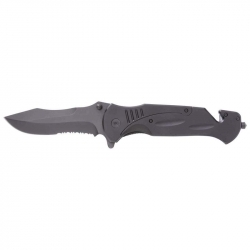 In addition to the popular liner lock, the Mossberg(TM) Lock Knife features a honed, 420 stainless steel titanium coated blade. 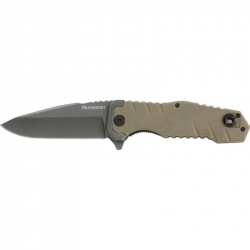 Rugged G-10 handle and reversible clip. Measures 4-3/4' closed, 8-1/8' open. Limited lifetime warranty. Clamshell. 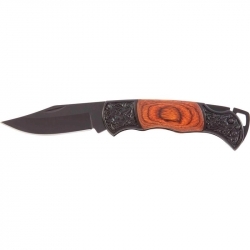 Features laminated wood handle with a stainless steel blade. Measures 17' overall. Aluminum storage case measures 17-13/16' x 1-3/4' x 3-3/4'. Limited lifetime warranty. Gift boxed. The marlinspike gives this one away as a sailor's knife. Featuring blades and tools adapted to be used with marine rigging, the Meyerco(R) Sailor's Knife is versatile enough to be used on land. 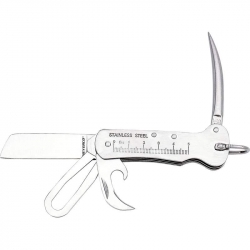 Stainless steel handle with engraved ruler, spike, honed blade, shackle key, and bottle/can opener work together to create a knife you'll use regularly. Measures 3-3/4' closed, 6-1/8' open. Limited forever warranty. Clamshell. 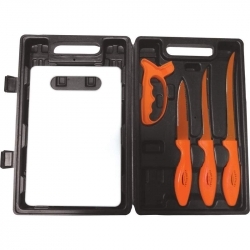 The Maxam(R)2pc Key Knife Set measures 2.25" closed. 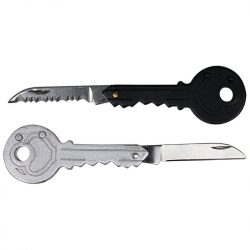 Durable 420 stainless steel construction, the Maxam(R) Key Knife features a one piece silver handle with a serrated-edge blade, and a 1 piece black handle with a honed-edge blade. 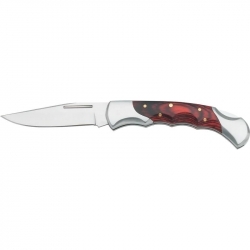 This knife measures 4' closed, 7' open and features hefty stainless steel handle with exotic wood inlays, belt clip, and half-serrated 420 stainless steel blade with thumbstud for easy one-hand opening. Limited lifetime warranty. Gift boxed. Stunning decorative bolsters are reminiscent of a vintage self-defense tool in this Maxam(R) Lockback Knife. 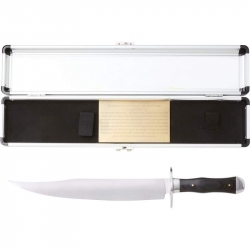 Quality and construction are completely modern in the non-glare honed blade and the rich, laminated wood handle. 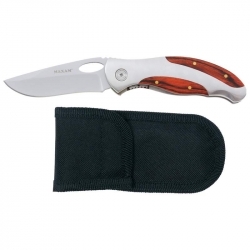 This Maxam(R) knife measures 4-1/4' closed and 7' open, the perfect size for a daily carry bag. Limited lifetime warranty. Gift boxed. 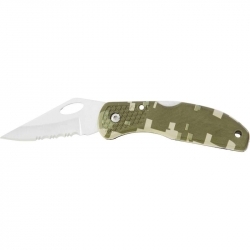 Features digital camo Leymar(TM) handle, clip, liner, and non-glare stainless steel half-serrated blade with oval hole for easy one-handed opening. Measures 4-1/8' closed, 6-3/4' open. Limited lifetime warranty. Gift boxed. 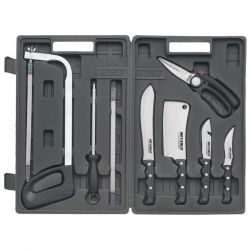 Features stainless steel blade, bolsters and liners, and laminated wood handle with brass pins. Measures 4' closed, 6-7/8' open. Limited lifetime warranty. Gift boxed. 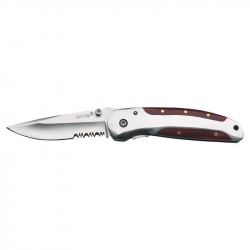 Maxam(R) Liner Lock Knife. Hefty stainless steel handle with exotic wood inlays. Measures 4" closed. Gift boxed.